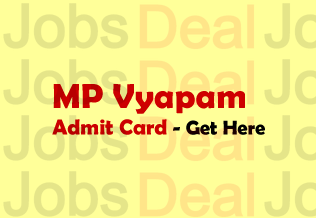 If you are curious to know when or how your MP Vyapam Samvida Shikshak Admit Card 2017 is supposed to be out, we make you sure that this article will be helpful for you, plus it will give you latest updates on MP Vyapam Samvida Shikshak Varg 1, 2, 3 Hall Ticket 2017 since the exam schedule is highly recommended to get better grades in the exam. The process of organising this exam will be done on the behalf of MPPEB Board. Today is the deadline for being part of this recruitment. After today, the people will no longer be able to fill up form anymore. Lately, Madhya Pradesh Professional Examination Board (MPPEB) uploaded a recruitment notice asking interested applicants for 41500 posts of Samvida Shikshak Grade 1, 2, 3. Do you think that you can still apply for this hiring? Yes, you can do that. But, it is available only for today i.e. 27th March 2017. After this date, there will be no more submission. The exams will be conducted on different dates depending on the type of the exam, viz. the Varg 1 Exam will be conducted from 27th to 29th May 2017, Varg 2 Exam will be held from 19th to 23rd August 2017, and Varg 3 Exam will be organised from 15th to 31st July 2017. At all exam centres, bringing MPPEB Samvida Shikshak Hall Ticket is mandatory otherwise, you will not be allowed to sit in the Test Centre. This is one of the current jobs trending in Madhya Pradesh (MP). Without holding the admit card, there is no entrance in the exam venue. The contestants must carry this essential piece of document while going to the exam centre. The information contained in this Call Letter is very essential for all contestants and they must not lose it. The information held by this Samvida Shala Shikshak Call Letter is the Name of the Candidate, their Date of Birth, Exam Date, Exam Venue, Special Instructions to the candidates. These details may also vary as the authority possesses the right to change or set new format of the Admit Card. The only way to access the MP Vyapam Varg 1, 2, 3 Admit Card is by going through the main web link that we have made available beneath. If you have trouble finding your Samvida Shala Shikshak Hall Ticket, you might want to take a look at the procedure settled beneath to make the download journey easier for you. You must know that not only the Hall Ticket is valuable for taking part in the exam but also the Exam Pattern. According to the Exam Pattern, the test will be based on Objective Type Questions also known as MCQ. The duration of the test is 2:30 Hours and the number of questions will be 150 and each one will carry one mark. Contenders can get entrance to the exam only by possessing the MP Samvida Shala Shikshak Hall Ticket which can be downloaded by entering the required information, such as “Username” and “Password”. While entering the date, make sure you enter the correct details. The wrong details will lead you to the disqualification. Firstly, look over to the main website of the board, viz. www.vyapam.nic.in. Look up “latest links” on the main page of the site. You will see a link regarding “MPPEB Samvida Shala Shikshak Exam” which you have to click on. And, then you would have to enter the information. Entering the data, you are supposed to submit the details. Once you have submitted the details to download MP Vyapam Samvida Shikshak Admit Card 2017, the procedure would begin and you will be capable of collecting your Hall Ticket. For further information, keep visiting!